Stephen Grey was born in Charlwood, Surrey, in 1822. By 1851, Stephen Grey was living in Brighton, working as a porter and messenger at 57 Marine Parade, where William Constable was operating Brighton's earliest photographic portrait studio. 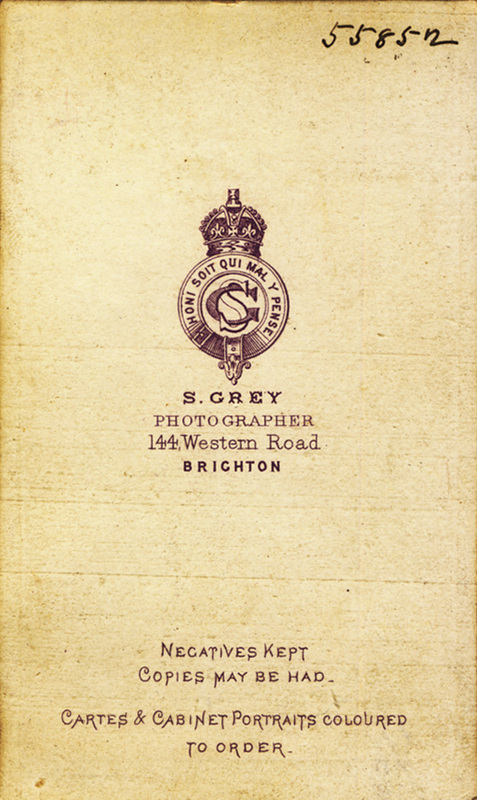 It is likely that Stephen Grey was introduced to photography during his employment at 57 Marine Parade. Later that year, Stephen Grey married a nineteen year old local girl named Jane Ann Wood (born c1832, Brighton). By 1852, Stephen Grey was working as a portrait painter and living in Eastern Road, Brighton. Grey & Hall's General Photographic Institution was unusual in that it offered to take portraits using all three of the available photographic processes. - Daguerreotype, Talbotype and Collodion Positive. 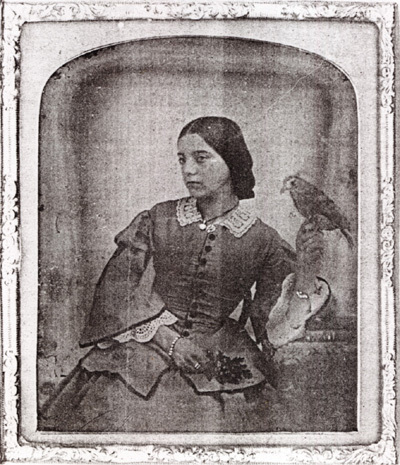 The patent on the daguerreotype, a positive image on a silver-coated copper plate, had come to an end on 14th August, 1853, and so, strictly speaking, Grey & Hall did not need to hold a licence for this particular method of photography. The Talbotype was a positive print on paper made from a negative using William Henry Fox Talbot's calotype process, which the inventor had patented in 1841. Professional photographers who wished to produce talbotype portraits were required to purchase a licence from William Henry Fox Talbot. In 1851, Frederick Scott Archer had invented a photographic process which involved coating a glass plate with a sticky substance called collodion. Archer had chosen not to patent his invention, but as the collodion process involved making photographs from a negative, Talbot claimed that the process was covered by his earlier patent. The Collodion Positive was a method by which an underexposed collodion glass negative was placed against a black background to give the appearance of a positive photograph. 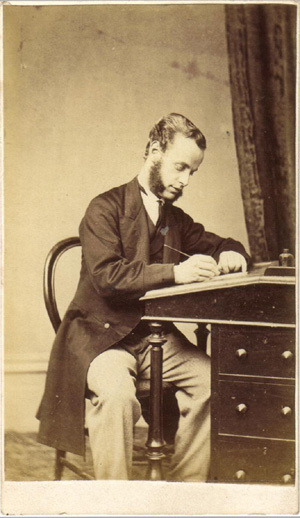 As Henry Fox Talbot had recently started legal action against photographers who were using the collodion process, alleging they were infringing his patent rights, Grey and Hall decided to purchase a licence from Talbot so that they were free to produce both Talbotype portraits and 'collodion positives.' By 1854, there were only nine photographic studios in England holding licences from Talbot and two of these were located in Brighton - Hennah & Kent's Talbotype Portrait Gallery at 108 King's Road and Grey & Hall's General Photographic Institution in St James's Street. 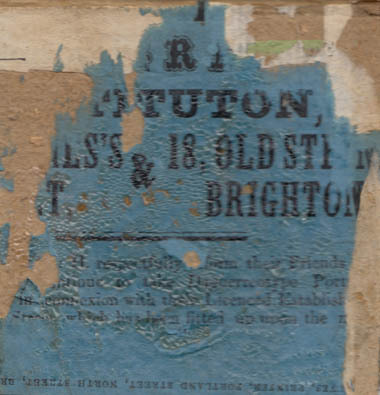 [LEFT] A fragment of a label advertising Grey & Hall's Photographic Institution at 13 St. James Street and 18 Old Steine, Brighton, which provides the backing to a framed coloured collodion positive portrait of two sisters dating from around 1855. 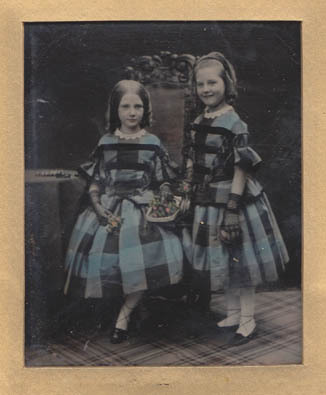 (The collodion positive portrait of the two girls is illustrated below). It appears that Stephen Grey and William Hall opened their second studio at 18 Old Steine, Brighton in the Autumn of 1854. An advertisement published in October 1854 mentions that Grey & Hall took photographs using "three distinct processes - Daguerreotype, Talbotype and Collodion". The collodion positive (ambrotype) process soon supplanted the daguerreotype in portraiture. Grey & Hall's Photographic Institution was located at 13 St James's Street, in the eastern part of Brighton called Kemp Town. St James's Street led to the Old Steine and ran parallel to Marine Parade on the eastern seafront and so was reasonably well located for visitors to the seaside town. 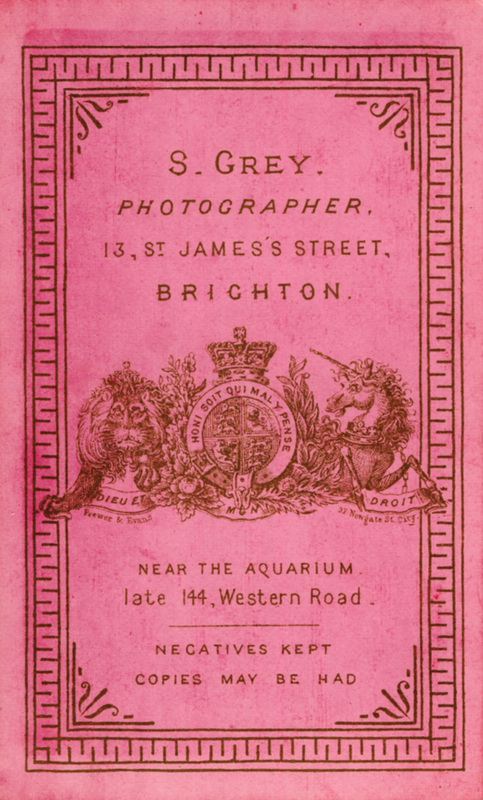 Folthorp's Directory for Brighton, which was compiled in September 1854, lists the business premises of Grey & Hall at 13 St James's Street, but within a month the two photographers had opened a second studio in the Old Steine. In October 1854, the firm of Grey & Hall was advertising a second studio at 18 Old Steine, but this branch studio was only in business for a short time. The partnership of Grey & Hall was dissolved on 25th November 1858. William Hall retained the studio at 13 St. James's Street and Stephen Grey established a separate studio of his own. 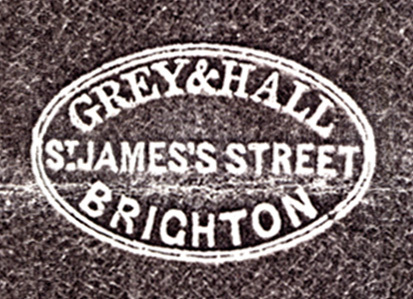 [ABOVE] The trade plate of Grey & Hall of 13 St. James Street, Brighton, which was stamped on the leather case of the collodion positive photograph shown above. 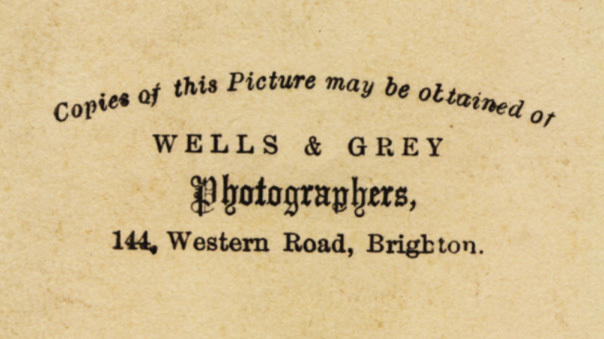 [ABOVE] Advertisement for Grey & Hall's Photographic Institution, 13 St. James Street, Brighton, which appeared in The Sussex Express on 7th October 1854. Stephen Grey married Jane Ann Wood (born c1833, Brighton) in Brighton in 1851. [Marriage registered in Brighton during Second Quarter of 1851]. The couple's first child, Sarah Jane Ann Grey was born in the Spring of 1852 and baptised on 1st August 1852 at St Nicholas's Church, Brighton. 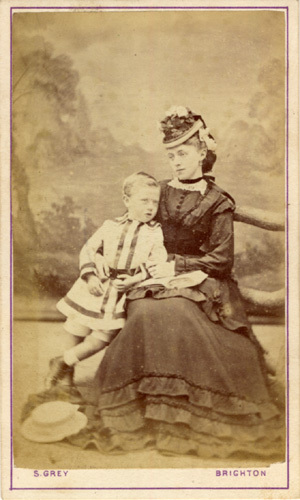 Their second child, Charles Stephen Grey, was born two years later and baptised in Brighton on 1st October 1854. Another daughter was born around October 1856 and was Christened with the name of Frances Mary Grey at Brighton's church of St Nicholas on 2nd November 1856. George Elijah Grey, Stephen and Jane's second son, arrived during the Second Quarter of 1859. From around 1854, Stephen Grey and his family lived in Park Street, Brighton. When the 1861 census was taken, Stephen Grey, his wife Jane and their four children were recorded at No 19 Park Street, Brighton. Stephen Grey is described on the census return as a "Photographist", aged 39. 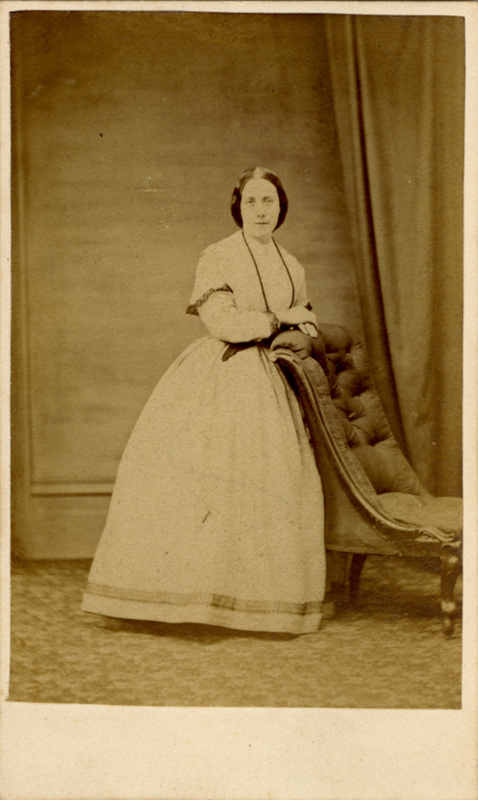 [ABOVE] A carte-de-visite portrait of a woman by Stephen Grey, Photographer, 144 Western Road, Brighton (c1866). Not long after Stephen Grey and William Hall parted company, the carte de visite portrait became popular and this led to an increase in the number of photographic studios in Brighton. 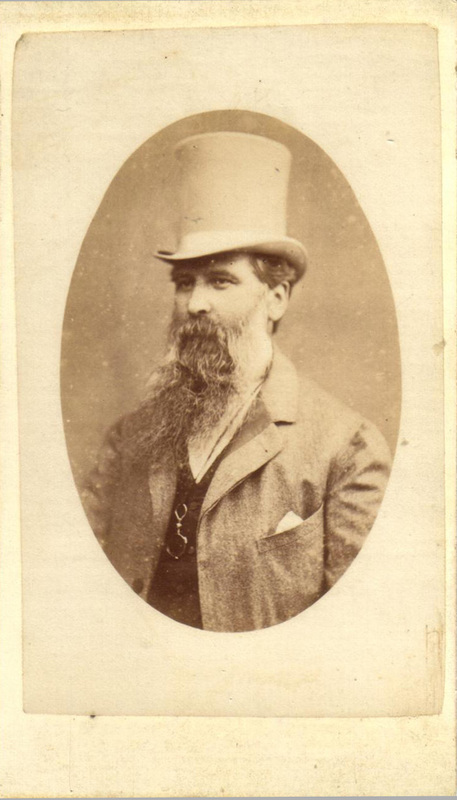 In 1862, Stephen Grey was one of two dozen photographers who had their own portrait studio in Brighton. In Folthorp's General Directory of Brighton published in 1862, Stephen Grey is listed as a photographer at 20A Norfolk Square. The carte de visite was a small photographic portrait pasted on a card measuring approximately 2 1/2 inches by 4 1/4 inches ( 6.3 cm by 10.5 cm) - the same size as a conventional visiting card, hence its name. * * In the mid 1860s, the average earnings of adult male workers was around 19 shillings a week. Adult women earned, on average, 11 shillings a week. By 1864, Stephen Grey had joined Francis Ross Wells at 144 Western Road to form the firm of Wells & Grey. Stephen Grey's business partner Francis Ross Wells (c1834-1893) had previously operated a studio at 27, St James' Street, Brighton. The partnership with Wells only lasted about a year and by October 1865, Stephen Grey was the sole proprietor of the studio at 144 Western Road and remained there for the next 10 years. 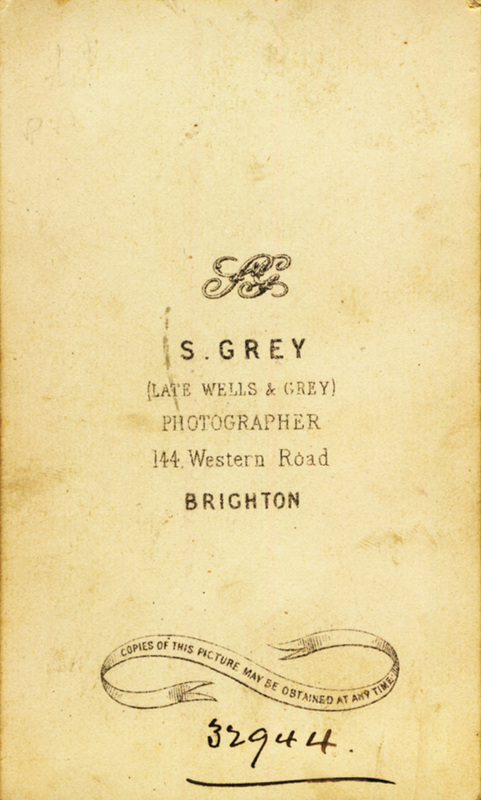 [ABOVE] The trade plate of Stephen Grey (Late Wells & Grey), Photographer, 144 Western Road, Brighton, as printed on the reverse of carte-de-visite portrait (c1865). At the time of the 1871 Census, Stephen Grey was residing at 51 Cobden Road with his wife and eight children. Stephen Grey is recorded in the 1871 census return as a "Photographer", aged 48. 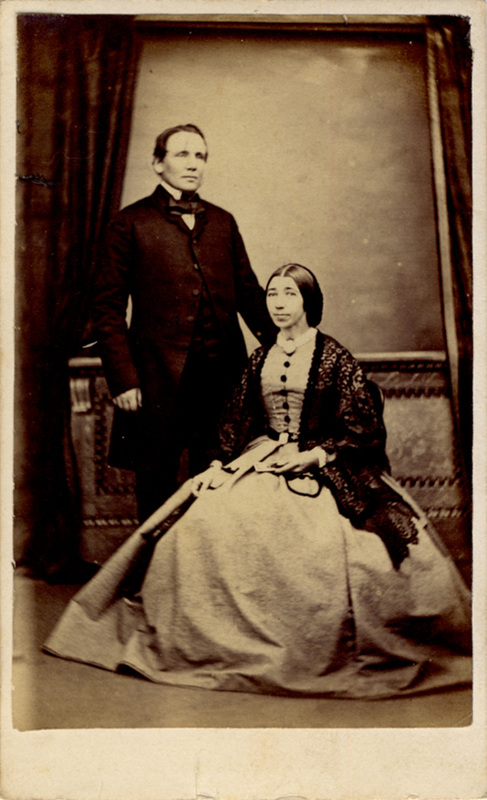 In 1871, the two eldest children, nineteen year old Sarah Grey and seventeen year old Charles Grey, were both assisting their father in his photographic studio and in the census return each give their profession as "Photographer". As each son became old enough to work, another photographer joined the family business. By 1890, Stephen Grey and all four of his sons were working as photographic artists. Towards the end of 1871, Stephen and Jane's youngest daughter, Emily Grace Grey, died before reaching her third birthday. Early in 1873, Sarah Jane Grey, their eldest daughter, married and left the family home. 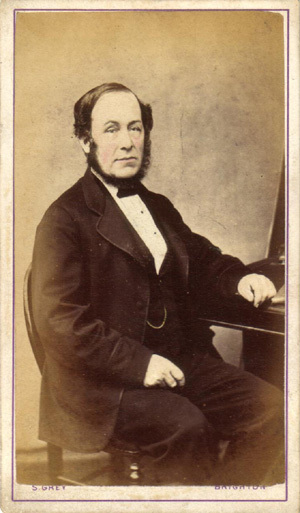 Sarah's place in the Grey household was soon filled by the arrival of Stephen Grey's last child - Sidney William Grey ( birth registered in Brighton during the Second Quarter of 1873]. Some time before 1876, Stephen Grey had returned to his original studio at 13 St. James's Street. By 1882, Stephen Grey had taken his sons into the family business and from this date the studio at 13 St James's Street went under the name of "Stephen Grey & Sons". 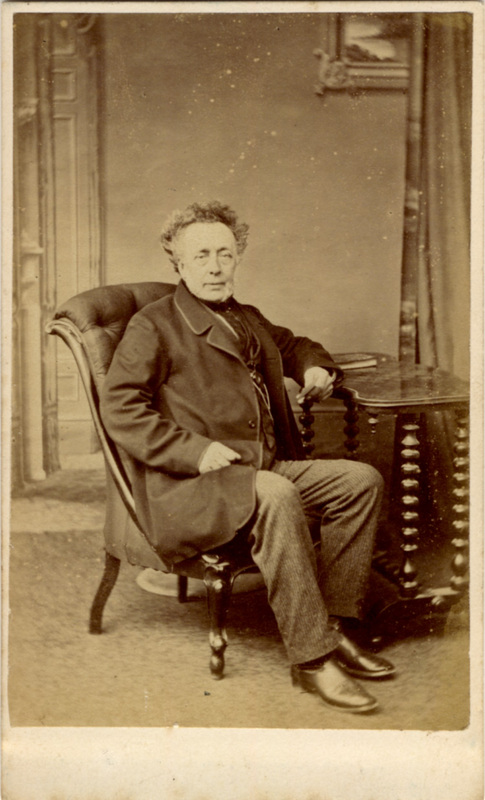 [ABOVE] A carte-de-visite portrait of a seated man by Stephen Grey, Photographer, 144 Western Road, Brighton (c1872). 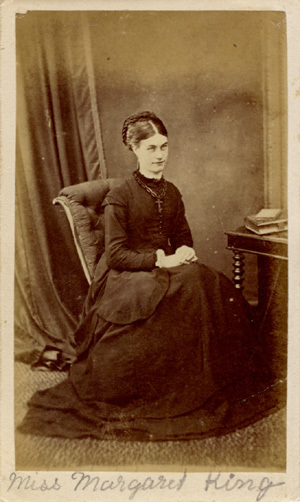 [ABOVE] A carte-de-visite portrait of Miss Margaret King by Stephen Grey, Photographer, 144 Western Road, Brighton (c1871). 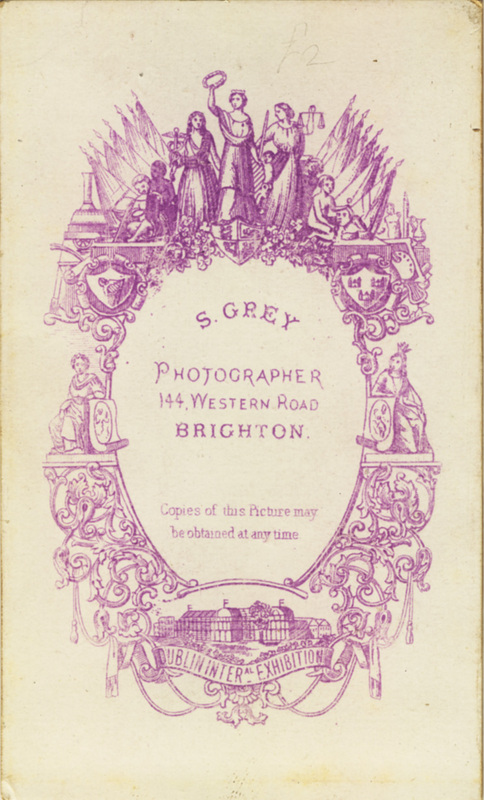 [ABOVE] The trade plate of Stephen Grey, Photographer, 144 Western Road, Brighton, as printed on the reverse of carte-de-visite portrait (c1871). The Dublin International Exhibition mentioned at the foot of the design took place in 1865. 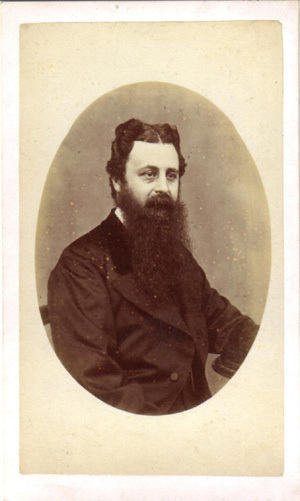 [ABOVE] A carte-de-visite portrait of a bearded man by Stephen Grey, Photographer, 13 St James Street, Brighton (c1876). See below for the reverse of this carte-de-visite. 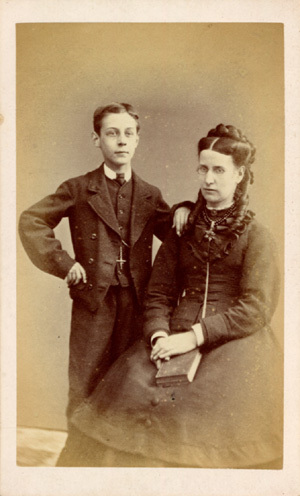 [ABOVE] A carte-de-visite portrait of a boy and a young woman by Stephen Grey, Photographer, 13 St James Street, Brighton (c1876). [ABOVE] A carte-de-visite portrait of a bearded man in a top hat by Stephen Grey, Photographer, 13 St James Street, Brighton (c1877). 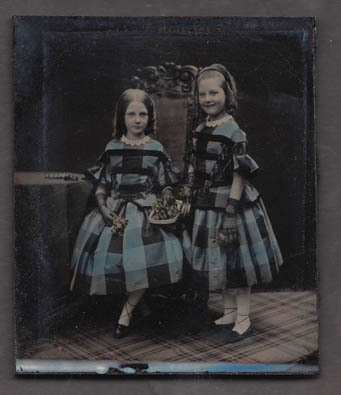 See below for the reverse of this carte-de-visite. [ABOVE] The trade plate of Stephen Grey, Photographer, 13 St James's Street, Brighton, as printed on the reverse of carte-de-visite portrait (c1876). The Brighton Aquarium mentioned in the address was opened in 1872. 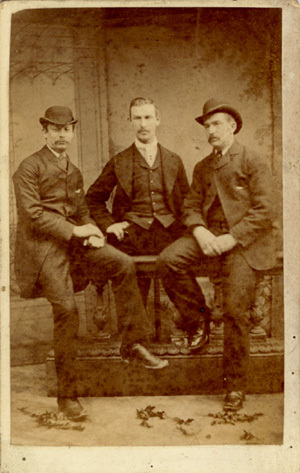 [ABOVE] A carte-de-visite group portrait of three men by Stephen Grey, Photographer, 13 St James's Street, Brighton (c1878). [ABOVE] The trade plate of Stephen Grey, Photographer, 13 St James's Street, Brighton, as printed on the reverse of carte-de-visite portrait (c1877). 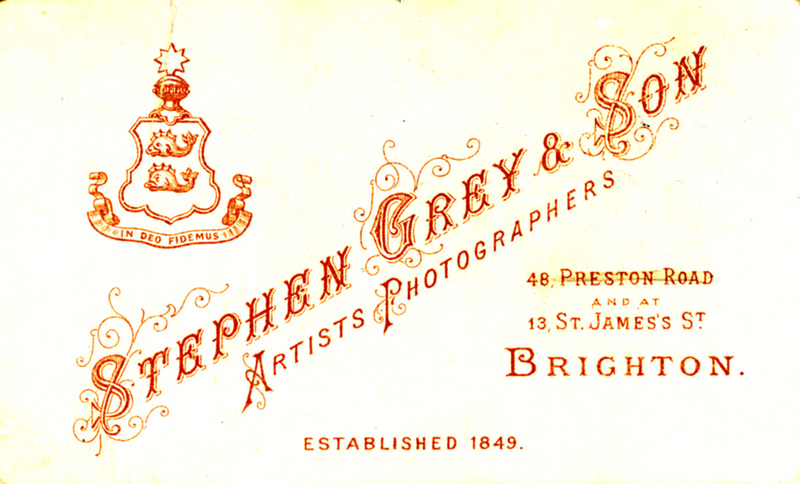 [ABOVE] The trade plate of Stephen Grey & Son, Artists, Photographers, 13 St James's Street, Brighton, as printed on the reverse of carte-de-visite portrait (c1887). 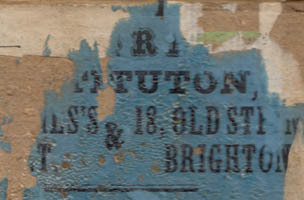 [ABOVE] The trade plate of Stephen Grey & Sons, Artist Photographers, 67 Lewes Road, Brighton (c1890). By 1881, George Elijah Grey had left the family home, but two of Stephen Grey's photographer sons, Charles and Walter, worked alongside their father in the family business. From around 1882, the studio at 13 St James Street went under the name of Stephen Grey & Sons. Stephen Grey ran a second studio at 48 Preston Road, but these premises were taken over by the photographer Henry Spink junior after only a year. 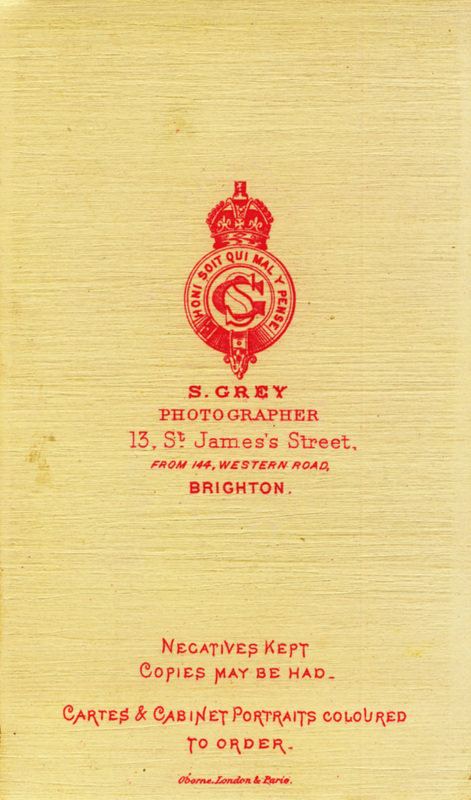 By 1885, Grey & Sons had opened another studio at 67 Lewes Road and around 1890, Stephen Grey vacated the St James Street studio, which passed to the photographer Alfred James. In 1890, Stephen Grey left Cobden Road and set up home at his new business premises at 32 Caledonian Road. By this date, Stephen's three eldest sons had married and were operating their own photographic studios. Charles S. Grey had taken over the family studio at 67 Lewes Road and George Elijah Grey had set up a studio at 70 Islingword Road. When the 1891 Census was taken, the only child living with his parents at the family home was 18 year old Sidney William Grey, who was assisting his father in the Caledonian Road studio. Over the last twelve years of his life, Stephen Grey suffered from an inguinal hernia. In April 1891 it was discovered that the hernia had become strangulated and that an operation was essential. Stephen Grey was admitted to the Sussex County Hospital and underwent surgery lasting three hours. Stephen Grey did not survive his ordeal and, on 29th April 1891, he died. He was sixty-eight years old at the time of his death. Stephen Grey had been active as a photographer in Brighton for nearly 40 years. Five of his children had worked as photographers in Brighton and three of these had operated their own photographic studios in the town. Stephen Grey's second eldest son George Elijah Grey (born 1859, Brighton) had established his own studio at 70 Islingword Road, Brighton around 1889. In 1891, George Grey and his wife Louisa were living in London. 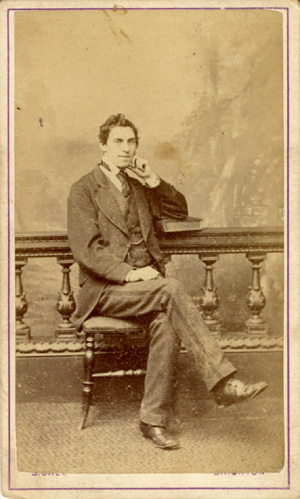 He returned to Brighton, but early in 1892, George Grey died at the relatively young age of 32. Stephen Grey's eldest son, Charles Stephen Grey (born 1854, Brighton) ran what he called the Military Photographic Studio at 67 Lewes Road, Brighton until about 1896, when it was sold to Ernest H. Jones. Another son, Walter James Grey (born 1854, Brighton) worked as a photographer in Stephen Grey's Brighton studio from the age of sixteen, but after his father's death he appears to have abandoned photography. In 1901, Walter Grey was working as an "Assurance Agent" in Willesden, Middlesex. Stephen Grey's youngest son, Sidney William Grey (born 1873, Brighton) took over the family studio at 32 Caledonian Road, Brighton, after his father died in 1891. Sidney (who went by the name of "Sydney W. Grey" in adult life) worked as a photographer throughout the 1890s. 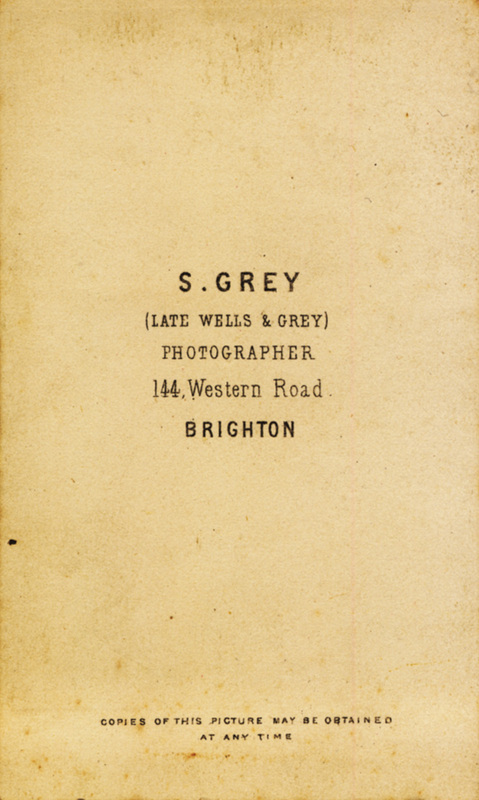 Around 1899, Sydney W. Grey opened a new studio at 172 Lewes Road, Brighton which he operated until the end of the First World War. By 1921, S. W. Grey's studio at 172 Lewes Road was in the hands of the London photographer Henry Brabazon. George Elijah Grey, Stephen and Jane Grey's fourth child and second eldest son, was born in Brighton during the 2nd Quarter of 1859. George Elijah Grey married Arabella Edwards (born 1856, Horringer, Suffolk) in Fulham, London, in 1887. Arabella Edwards, George's bride, was the daughter of Susannah and Valentine Edwards, a carpenter from Horringer (Horningsheath), a Suffolk village 2 miles south-west of Bury St. Edmunds. Mrs Arabella Grey gave birth to a daughter named Mabel Olive Grey in 1888, when she and her husband were living in Fulham. A second daughter, Elsie Hilda Grey, arrived the following year. George Grey and his family were still living in London at the time of the 1891 census. Sadly, George Elijah Grey died early in 1892 at the age of thirty-two. Following George Grey's death in 1892, his widow Mrs Arabella Grey placed her children in the care of her parents in Horningsheath and went back to work as a cook in London in order to financially support her two young daughters. Around 1908, Mrs Arabella Grey and her two grown-up daughters emigrated to New Zealand. [RIGHT] A detail from a Victorian map of Brighton showing the approximate location of George Elijah Grey's photographic studio at 70 Islingword Road, Brighton. 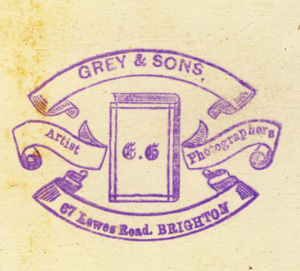 George Grey operated as a photographer at No 70 Islingword Road, Brighton for a brief period in the late 1880s. Detail from a Victorian Map of Brighton (c1882). 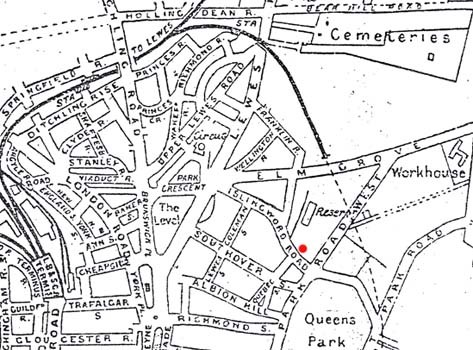 The approximate location of George Elijah Grey's studio in Islingword Road is marked by a red dot. Sarah Jane Ann Grey (born 2nd Qtr 1852, Brighton ; baptised 1st August 1852). Photographer in 1871. Married 1st Qtr 1872. Walter James Grey (born 4th Qtr 1865, Brighton ; baptised 7th January 1866 ). Photographer. Married 1st Qtr 1886 = Edith Caroline Chappell (born c1868, Bramber, Sussex ). Alice Harriett Grey (born 1st Qtr 1868, Brighton ; baptised 5th April 1868 ). Married 2nd Qtr 1888 = Alfred Edward Priest. Thanks to Gill Clayton, a great, great grand daughter of Stephen Grey, for providing additional information on Stephen Grey's family. Thanks also to Alan Fry of Lincolnshire for extra information on Stephen Grey's family. Alan Fry is a great, great grandson of Stephen Grey. Alan's great grandmother was Elizabeth Annie Grey (aka Anne Elizabeth Grey), one of Stephen Grey's daughters. Elizabeth Annie Grey married Elias Richard Patching (1857-1889) in 1884 and together they ran The Bridge Inn at Upper Beeding, where Alan's grandmother was born in 1885. I am grateful to Jenny Harnett of Auckland, New Zealand, for providing further details relating to the family of George Elijah Grey, the second son of Stephen Grey. Jenny Harnett is the great grand-daughter of George Elijah Grey (1859-1892).